The universe has many secrets. It may hide additional dimensions of space other than the familier three we recognize. There might even be another universe adjacent to ours, invisible and unattainable . . . for now. 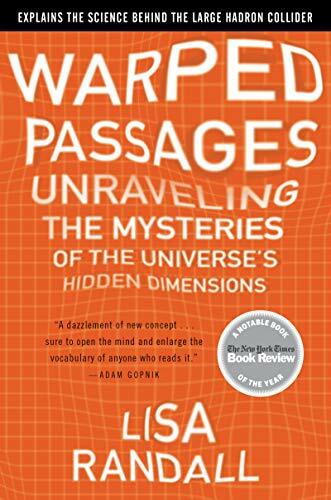 "Warped Passages" is a brilliantly readable and altogether exhilarating journey that tracks the arc of discovery from early twentieth-century physics to the razor's edge of modern scientific theory. One of the world's leading theoretical physicists, Lisa Randall provides astonishing scientific possibilities that, until recently, were restricted to the realm of science fiction. Unraveling the twisted threads of the most current debates on relativity, quantum mechanics, and gravity, she explores some of the most fundamental questions posed by Nature taking us into the warped, hidden dimensions underpinning the universe we live in, demystifying the science of the myriad worlds that may exist just beyond our own. Lisa Randall studies theoretical particle physics and cosmology at Harvard University, where she is Frank B. Baird, Jr., Professor of Science. A member of the National Academy of Sciences, the American Philosophical Society, and the American Academy of Arts and Sciences, she is the recipient of many awards and honorary degrees. Professor Randall was included in Time magazine's "100 Most Influential People" of 2007 and was among Esquire magazine's "75 Most Influential People of the 21st Century." Professor Randall's two books, Warped Passages (2005) and Knocking on Heaven's Door (2011) were New York Times bestsellers and 100 Notable Books. Her stand-alone e-book, Higgs Discovery: The Power of Empty Space, was published in 2012.